Now that fall is upon us, it’s time to dust off your soup pot. As the weather cools off, there’s nothing better than a hot cup of soup to warm the soul — and your belly. 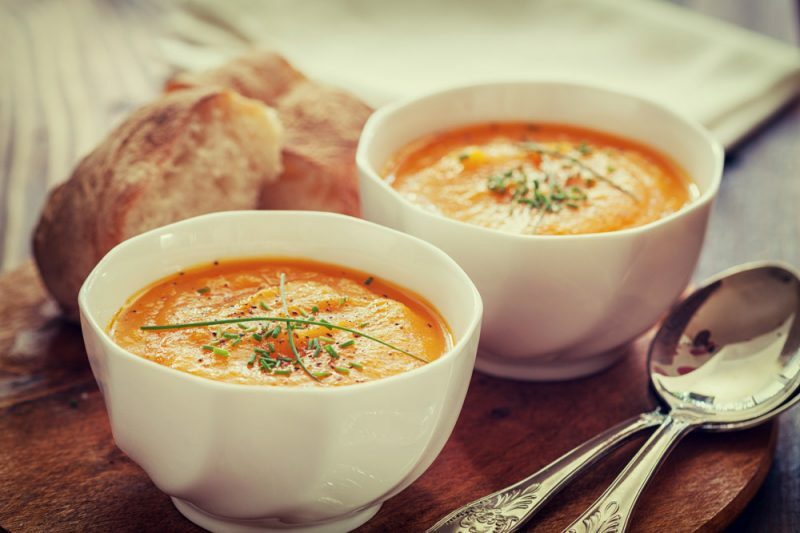 And we’ve got just the soup recipe for pregnant or breastfeeding moms: Carrot-ginger soup. Carrots are chock full of vitamin A, which can help develop a baby’s eyes and bones, while ginger is rich in vitamin C and iron to support their immune system. Ginger can also help soothe your morning sickness and nausea. 1. Heat canola oil over medium heat in a heavy saucepan and add the onion. Cook until it’s translucent, about 5 minutes. 2. Add the carrots and ginger and cook for another 5 minutes. 3. Add the chicken broth and bring to a boil. Lower the heat and simmer for about 20 minutes, or until carrots are tender and easily pierced by a fork. 5. Return soup to the pot to warm, then serve.